Liquefied petroleum gases (LPG) are the mixtures of liquefied under the pressure light hydrocarbons; at normal conditions they stay in gaseous state. Basically LPG is obtained in the process of hydrocarbon production during oil-dissolved gases refining and crude oil stabilization. Trip gasses and isolated gasses are also used as a raw for getting liquefied petroleum gas. It is also possible to get LPG on oil-refining plants. Gas phase is used for distributing along gas pipelines and for use as a fuel. LPG is used for heating, cooking, for hot water supply systems, electric power supply, for work of different kinds of appliances and systems. The main components of liquefied petroleum gas are propane and butane. Butane is colorless combustion gas with specific individual smell, it can be easily liquefied. 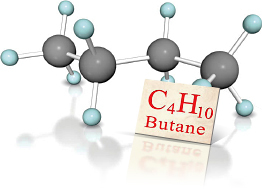 Butane is highly volatile liquid which passes to gaseous state and free-burns at the following conditions: free air temperature lower than 0 °C and under atmosphere pressure; at increased pressure and at usual temperature. Butane arrives in the process of cat-cracking and hydrocat-craking of petroleum products, during oil-dissolved gas division, which is natural combination gas. Butane-butylene fraction (BBF) is received on catalytic cracking units of vacuum gasoil. Butane-butylene fraction is usually used in petroleum industry as a raw material for production of high-octane additives for gasoline. At the same time butane-butylene fruction is used as a raw material in chemical industry and to produce chemical rubber. Commercial propane/butane mix (CPBM) is widely used in municipal-domestic field in all climatic areas of Russia at the air temperature no lower than 20°С. 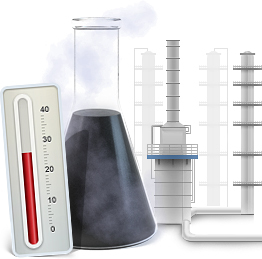 CPBM is produced from condensate cut of natural gas or from oil on special columns of gas fractionating plants. Commercial propane/butane mix is easily mixed with air providing proportional and complete combustion.